Teaching and Helping People is the Best Reward! I enjoy both speaking and teaching. It is now a requirement that before a licensed insurance agent can sell any type of Long Term Care insurance, they must have an initial 8 hour certification course and every two years an additional 4 hour refresher course. I not only teach these in several states, but I also write the courses for a number of states. Long Term Care financing is a very specific and complex area. It requires knowledge of estate planning, tax law, social work, financial planning, legal documents and more. I have done nothing but this for over 23 years now and am very motivated to be sure my advice and planning works as desired when care is needed, sometimes decades later. Knowing what is happening with interest rates, minimum wage, demographic changes, health care, Long Term Care facility usage projections as well as home care services projections is very important. It is not necessary to lecture a customer on every one of these factors, but all of them must be taken into account. Many insurance agents who dabble in this field do not think to include all of these factors in their planning. That is why I enjoy writing and teaching the required courses, to bring the agents who will work in this area up to speed as much as possible. 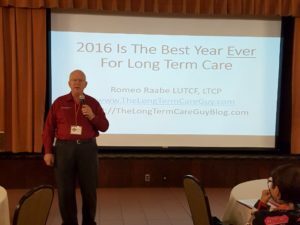 Speaking to conferences on Long Term Care planning is also enjoyable, not only for the free trip (mini vacation) but the industry needs up to date information on current trends, new products and how best to use them. Planning with clients is much the same, but needs to be explained using language they use and understand versus industry jargon. For example, the phrase elimination period actually means the deductible, the time before the insurance starts paying. However, if you ask a nurse what the elimination period is, the nurse might suggest the time in the bathroom with the newspaper. Life is too short to not have some fun, even when discussing a serious topic such as this. The best speaking, however, is when a client or the children of a client call and tell me that Mom or Dad could never have afforded the wonderful care they are now receiving in such a nice place without the Long Term Care insurance that they hesitated to purchase years before. They are now receiving hundreds of times more back in benefits than they paid out in premiums over the years. That is what makes it all so rewarding.